What is Dalkeith THI and CARS? A Townscape Heritage Initiative(THI) and Conservation Area Regeneration Scheme (CARS) are jointly funded grant programmes that provide money for regenerating towns and enhancing the appearance of Conservation Areas through the repair of historic buildings and spaces. 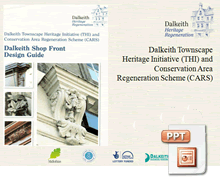 The Dalkeith Townscape Heritage Initiative and Conservation Area Regeneration Scheme has been developed by Midlothian Council and Dalkeith Business Renewal. The project is jointly funded by the Heritage Lottery Fund, Historic Scotland, Midlothian Council and Dalkeith Business Renewal. The formal launch of the Dalkeith THI and CARS took place on Thursday 15th April 2010 with a week long series of events. The Dalkeith THI and CARS is a five year regeneration scheme now in its fifth year and has improved a number of historic buildings in the centre of Dalkeith through grant aid together with the enhancement of building frontages, shopfronts and improvements to the public realm. The Historic Scotland ,CARS, element of the scheme closed in March 2013. The Heritage lottery funded ,THI , element of the scheme finishes at the end of June 2014. The scheme has achieved it's main objectives and targets, 30 properties have been grant aided , the High Street and Vennels public realm improvements have been completed and the training ,education and awareness raising is continuing, having achieved a good deal up to now. The 4 priority projects,1-3 Musselburgh Road , 1-3 High Street, the former Cross Keys Hotel and the Tolbooth have all been repaired and restored and 26 priority properties in the High Street have been repaired and restored with the benefit of grant aid. The Training Plan continues with Edinburgh College and has provided the opportunity for contractors, building professionals , trainees ,school children and home owners to attend courses and gain knowledge of traditional building skills. These have been held annually over the last three years. The wider education and community emgagement aspects of the scheme have delivered a number of projects with different partners , ie the Dalkeith Youth Forum's "Dalkeith at a Cross Roads" project and DVD, The Dalkeith Heritage Trail Group planning and implementing the Dalkeith Heritage Trail ,the development of the shopfront Design Guide with traders in the town and the work in partnership to develop a future for the Corn Exchange . The Heritage Lottery Fund (HLF) gives a grant to a local partnership managing a “Common Fund”. This contains funds from HLF, Historic Scotland, Midlothian Council and Dalkeith Business Renewal. The Partnership agreed the priority projects and buildings within the Dalkeith THI and CARS and repair and restoration work is complete on all the schemes. How much money was available? Initially the Dalkeith THI and CARS Common Fund amounted to £1.8m and with owners contributions this amounted to £2.5m.With additional grant aid from Historic Scotland and Dalkeith Business Renewal the common fund has increased to £1.9m, resulting in an overall investment of £3.0m. May 2010 public consultation on the improvements to the High Street . October 2010 Midlothian Training Services, back to work adult group presented their findings on the proposed heritage trail for the town centre. January 2011 formation of the Dalkeith Heritage Trail Group. February 2011 High Street enhancement scheme started. April 2011 launch of the Dalkeith Shopfront Design Guide and the Dalkeith Youth Forum's DVD, "Dalkeith at a Crossroads" . June 2011 the Dalkeith Training Plan launched. August 2011 High Street Enhancement scheme practically completed. October 2011 Production of an Interpretative Strategy and Proposals for the Dalkeith Heritage Trail. December 2011 Presentation of certificates to the first set of trainees attending the training plan courses. December 2011 Opening event for the completed shopfront at 41 High Street, opticians. June 2012 St David's High School, Dalkeith Campus takes part in the Schools Heritage Skills Awareness Training course. October 2012 Opening event for 1-3 Musselburgh Road . January 2013 Fiona Hyslop visits to announce next round of Scotland's CARS schemes and tours Dalkeith High Street viewing projects. 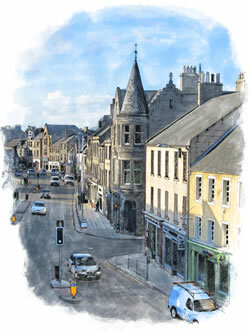 February 2013 Reopening of the Tolbooth by the Duke of Buccleuch. February 2013 The "iwozheredalkeith" plaque scheme launched as part of the Dalkeith Heritage Trail. March 15th 2013 The opening event for 69-71 High Street (WHSmith) was held in the Arts Centre, Dalkeith. End of March 2013 the completion of the Historic Scotland (CARS) element of the scheme , audit report completed. April 12th 2013 opening ceremony for the former Cross Keys Hotel at the completed scheme. May 22nd 2013 Home owners seminar /exhibition /presentations at the Arts Centre Dalkeith. June 13th Tolbooth archaeology seminar at the County Hotel Dalkeith then on site at the Tolbooth. September 14th 2013 Doors Open Day , Corn Exchange open with an exhibition and demonstrations at ther County Hotel Dalkeith . November 5th 2013 opening ceremony for 1-3 High Street at the Arts Centre Dalkeith . December 4th 2013,Historic Scotland CARS seminar in Dalkeith Arts Centre with conservation officers from all over Scotland to see how a successful scheme was delivered in Dalkeith . January 2014,the last grant was awarded to no 2 High Street , The Blossom Garden Restaurant for repair and restoration work. January 2014,Project developed with the Princes Trust results in temporary art work panels for the Corn Exchange windows. Young people from Mayfield successfully demonstrate their artistic skills. February 2014,Melville Housing Association successfully acquire ownership of the Corn Exchange and with grant aid from HLF and Historic Scotland start the repair , conversion and restoration work to secure the buildings long term future. March 27th 2014, The Tolbooth and former Cross Keys Hotel repair and restoration scheme shortlisted for the Scottish Civic Trust My Place Awards. May 29th 2014, Final event , walkabout the town centre with partners and community groups to assess the achievements of the scheme. June 6th 2014, on site training to repair walls and area at the rear of 85 High Street . June 9th -June 17th 2014, final exhibition of the scheme in Dalkeith Arts Centre. June 13th 2014,Final presentation on the achievements of the scheme in Dalkeith Arts Centre. June 16th 2014,Final THI/CARS Steering Committeee meeting to assess the achievements of the scheme and to plan for the future. June 17th 2014,Opening event with exhibition, presentation and leaflet for the completion of no 2 High Street repair and restoration scheme ( The Blossom Garden Restaurant).